Including or citing Twitter content in webpages is important for many websites. Twitter provides an easy way. 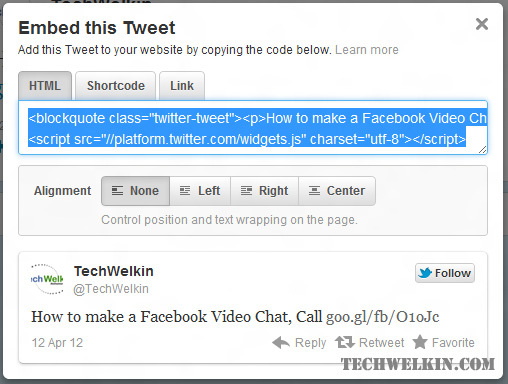 Learn the steps you need to follow in order to embed a tweet in your webpage. With ever increasing popularity of micro-blogging platform Twitter –now it has become quite a common practice to cite a tweet on a webpage. Earlier, people used to copy the tweet text from Twitter and paste it in their website or blog. But such pasted text does not look truthful in first look. Users may doubt that the website owner may have changed something while pasting the tweet. So, users will any have to visit Twitter to verify what you’ve pasted on your website. This is the reason why Twitter provided facility to embed a tweet in any webpage. Embedded tweet gets its text directly from Twitter and website owner has no way to alter it. STEP 3: Select, either HTML, Shortcode or Link version of the code. HTML code will work in all kinds of website. Shortcode is for WordPress based websites and other platforms that support shortcode notation. BONUS TIP: You can embed not only single tweet but also a full Twitter conversation and also tweets with photos and videos. I hope it was useful for you. Please let me know if you have any questions about this topic. Thank you for using TechWelkin.